Lola Granola Bars are delicious gluten-free snack bars, packed with natural proteins and omega 3’s, but low in sodium and contains no GMOs. Most of their ingredients are sourced in the USA, and some come from there in the North East like Massachusetts Cranberries, Jersey Blueberries, New York Honey and Gluten Free Oats. Emilee at Pea of Sweetness had a chance to try these delicious gluten-free granola bars. Lola Granola Bars are enjoyed by Moms, Athletes, College Students, On the Go, Kids, and Grandparents. Grab one today and enjoy our delicious home made taste. 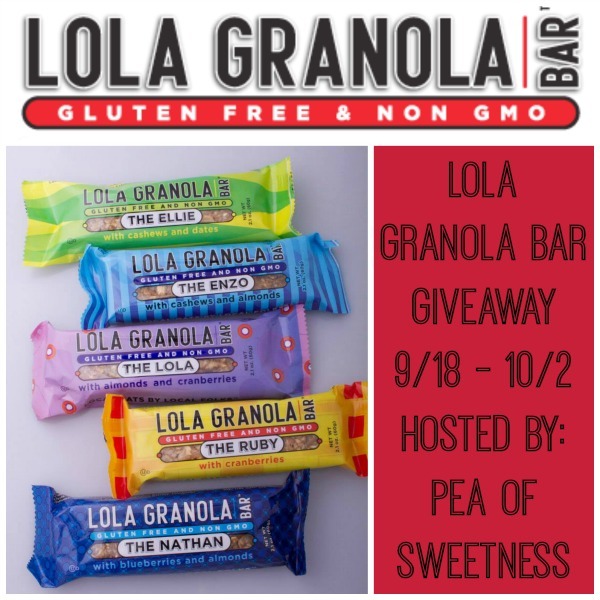 One winner will receive an assortment of Lola Granola Bars. This giveaway begins on 9/18 at and ends on 10/2 at 10:00pm (times are Central) and is open to Continental US residents ages 18+. Winner is subject to eligibility verification and will have 48 hours to confirm before a new winner will be drawn. For any questions/concerns please email emilee.roberts@peaofsweetness.com (consider adding this email to your “Safe List” as winning email notification will be sent from this email.) Please refer to the full terms and conditions in the Giveaway Tools. I want to try The Ellie, thanks! I would like to try the Ellie! I’dlike to try the Ellie: cashews & dates! Looks good to me!